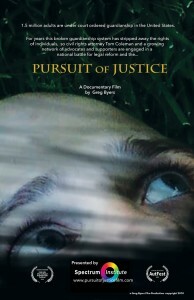 The Pursuit of Justice, a film by Greg Gyers and an award winner at this July’s Colorado International Activism Film, has launched a new poster for the documentary. The Pursuit of Justice tracks the activities of the Disability and Guardianship Project, launched by Spectrum Institute. The project over the past few years has advocated for guardianship and conservatorship reform in California, Oregon, Washington, Texas, Missouri, Michigan, Pennsylvania and many other states, and as it has sought the involvement of the United States Department of Justice through the application of the Americans with Disabilities Act to state guardianship proceedings. The film poster, which is about guardianship reform, includes an image of Mickey, a victim of abuse allegedly committed by his parents/conservators, looking up helplessly from the lawn in his parents’ backyard. Mickey was supposed to be under the “protection” of the probate court in California at the time. Mickey’s case is what captured the attention of Dr. Nora Baladerian and attorney Tom Coleman in 2012 about the need for guardianship and conservatorship reform.